A REGULAR but tedious task in many laboratories is the coating of disposable items of labware with extracellular matrix proteins such as collagen or fibronectin before performing cell culture operations. Now an application note from Integra Biosciences demonstrates how this laborious process can be speeded up significantly through use of a Dose-It peristaltic pump. The company says this approach can result in time savings of 40%, compared to standard methods using a pipette controller, with additional benefits of reducing the repetitive strain on lab workers. A comparison of the two methods fopr the coating of 100 petri dishes forms the basis of the application note. Key to the faster performance of the Dose-It pump is that the liquid transfer process is performed in one step rather than two. 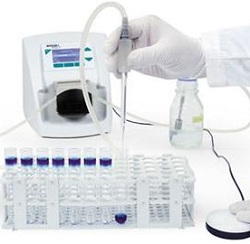 Using a pipette controller, first the liquid is drawn into the pipette and second it is dispensed into the petri dish. The peristaltic pump approach is a one-step process, where the fluid is transferred directly from the reservoir into the labware.